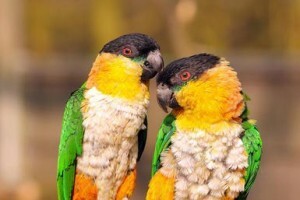 From the bird breeds, the parrots are maybe the most popular one that people prefer for company. There is a very wide range of parrot varieties and the records nowadays list around 380 options. A few examples of these breeds of birds are the parakeets, budgies, macaws, amazons, cockatoos, cockatiels and many others. The most common regions where parrots live are the tropical and subtropical areas, but they also are found in areas with temperate climate. Many species considered species are also endangered species, which makes people be careful and they will make available as pets only the parrots bred in captivity. If one looks to get a parrot, it’s comfortable to know that there are a lot of breeds of parrots that are suitable to be pets which one can choose from, each breed having its own characteristics. But it’s also important to know that not any parrot can make a good partnership with any individual, therefore a series of factors need to be considered. These factors include the level of care required, the cost, the level of noise a particular parrot makes, space requirements, food availability, socialization level needed and accepted and last, but not least, what exactly the potential owner expects of a pet parrot. The parrots are probably one of the most impressive appearances from all the bird species, from a color palette point of view. While some of them may be solemn and majestic in behavior and stature, more reserved in nature, other can be really cute and intensely socialize. But any type of parrot requires patience and efforts in order to understand its behavior and needs, so that, further on, can play the role of a good companion. Member of the parrot group, the Cockatiel is mostly a gray presence. Both the male and the female have almost entirely gray colored bodies, but the male has a solid yellow head as opposed to that of a female which would be a lighter shade of yellow. Both have black feathers in the undercoat of their tails. However, there are more color ranges and combinations for the Cockatiels. Originating in the South-East regions of Asia, the Parakeets are a breed of small parrots that are often kept as cage birds. There are several color varieties of the Parakeets, including violet, pastel blue, white, dark green or yellow and they are spread all over the world. Well known for its diplomacy and friendliness, the Conures are parrots originating in the Central and South America. They are lovely as pets and the wild ones are getting along very well with one another, but they do tend to be very noisy, with the exception of Pyrhurra Conures. The Parrotlet is a part of the wider Parrot family and is a small bird, not measuring more than 15 centimeters in length. They are the classic type of parrot, having the same virtues and flaws, but their active nature and good moods make them excellent companions. 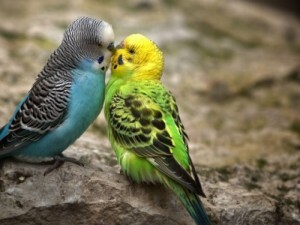 There is a category of parrots that are known as Lovebirds and they come from Africa. They gained this name due to their affectionate behavior towards one another, when they find themselves in pairs. Sitting very close and grooming one another is the typical Lovebirds behavior, birds that are rather small in size, not measuring more than 15 centimeters in length. The Amazon parrots could originally be found in South and Central Americas and they are vividly colored, with green being the predominant color. Their diet in the wilderness includes nuts, leafs and fruits. 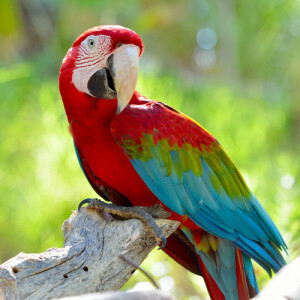 Originating in the tropical areas of America, the Macaw presents itself in a very wide range of sizes, from those of a pigeon up to about one meter long. Long tails and large beaks are specific for this group of parrots, which wear a very bright palette of colors, which led a lot of people to name them ‘winged rainbows’. One younger breed of pet parrots is represented by the Caiques. Despite their young age, they managed to rapidly gain popularity due to their active, friendly and playful temperaments, along their beautifully colored plumage. They are known to develop talking abilities and are very curious in nature, a combination that always entertains the people around them. Many consider this bird close to the ideal pet parrot, due to all these wonderful traits. The Cockatoo parrots can belong to quite a few parrot breeds in North-Western Asia and Australia. They have a powerful bill with a hook aspect and tongues that are both fleshy and thick. These physical traits, along with the strong legs are characteristic for the parrots in general. Their uniqueness resides in the presence of the feather crests on their heads that they are able to lower or raise. The Poicephalus Parrots have rather sturdy bodies and a strong beak as well. This moderately sized parrot originates in Africa, but it had spread to many other regions. This group of parrots includes several species, of which we mention Jardine’s, Senegal Parrot, Meyer’s, Brown-Headed, Yellow-Faced, Niam-Niam, Cape/Uncape, Ruppell’s, Red-Bellied and a few others.